Critics say the industry ignored the recommendations, and was able to without any real oversight. 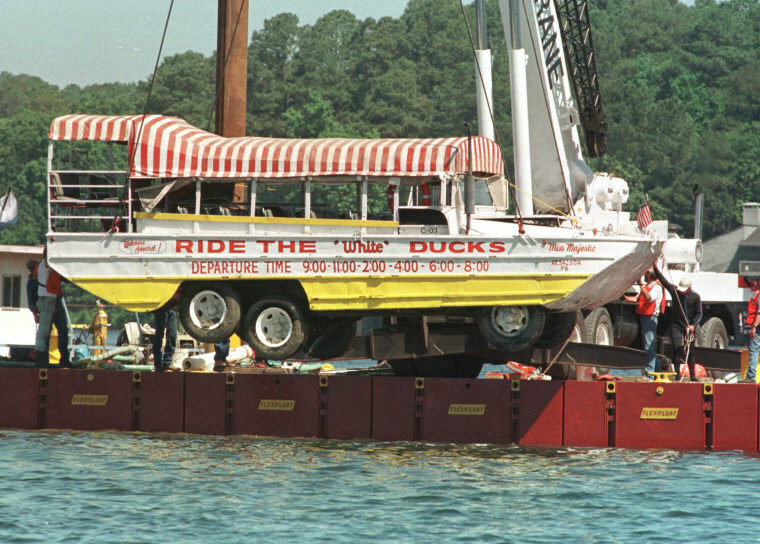 Nearly 20 years ago, a duck boat dubbed the Miss Majestic eased into a lake in Hot Springs, Arkansas, as part of a regular tourism loop. The boat had a cheerful red-and-white striped canopy on top, bright yellow siding, and — up until that point — a stellar safety record. Within seven minutes, the Miss Majestic had sunk to the bottom of the lake, killing 13 people. The 1999 tragedy was determined to be due to inadequate maintenance of the vessel, according to the National Transportation Safety Board. In a 2002 report on the incident, the NTSB suggested a list of recommendations that other duck boats operators could follow to keep their passengers safe, including removing the canopies, which had restricted passengers' ability to escape once they were underwater; and adding backup buoyancy, so vessels could stay afloat even if they got flooded. But nearly 20 years later, many of those recommendations still have not been widely implemented — something critics say has resulted in dozens of preventable fatalities since. The calls for regulation are louder than ever after the latest accident, the capsizing on Thursday of a duck boat near Branson, Missouri, which killed at least 17 people. National Transportation Safety Board Member Earl Weener said Friday that the dead included 16 passengers and one crew member. In all there were 29 passengers and two crew members on board. The Coast Guard plans to raise the sunken vessel as part of the probe. A preliminary NTSB fact report could be finished in a month, but the full investigation could take a year, Weener said. Originally used by the U.S. military during World War II, duck boats are amphibious vehicles that are now often employed to carry tourists from land to water. They operators usually promote a festive atmosphere for their passengers, sometimes handing out kazoos that make quacking noises, or playing music during the sightseeing tours. But when it comes to safety, they have a troubled history. "If we had this type of event on a repeated basis with other forms of transportation, I think we would have seen responsible regulatory agencies banning their use." Counting the latest fatalities from Thursday, nearly 40 people have been killed in duck boat accidents in the United States in the last 20 years. The accidents have happened both in the water and on the road, leading safety advocates to question why the industry isn't more tightly regulated — or why duck boats haven't been banned altogether. Ride the Ducks Branson, the organization which owned the doomed Missouri duck boat, said, "the safety of our guests and employees is our number one priority." But the duck boats have an inherent safety problem that is twofold, critics say. For one thing, they're oddly shaped, with a design that lends itself to blind spots. "I don't think those vehicles were designed for the recreational use they're being used for," said Jim Hall, who was NTSB chairman when the 1999 Arkansas sinking happened. "They're not safe." The second issue is a lack of clear oversight. Regulation is mostly done through a patchwork of state or local agencies. The National Highway Traffic Safety Administration regulates their travel on the road but was not immediately able to give NBC News a response when asked whether the agency had ever considered banning duck boats or implementing federal requirements for them. The U.S. Coast Guard, another such agency that regulates duck boats, said it sets limited parameters on the vessels, such as requiring them to have a certificate of inspection and authorizing a certified route for them, but doesn't have much involvement beyond that. Hall believes duck boats should be outlawed altogether. "If we had this type of event on a repeated basis with other forms of transportation, I think we would have seen responsible regulatory agencies banning their use," he said. Robert Mongeluzzi, a Philadelphia attorney who has represented the families of victims in two separate duck boat accidents that happened in his city, agrees, and has spent the past decade advocating for duck boats to be prohibited. "They are death traps and they should be banned," he said. "It has been an industry that has policed itself and I believe the industry itself has been outrageous and reckless." There have been some improvements. In Boston, new safety regulations like blind spot cameras and proximity sensors, plus a second employee on board to narrate the tour so the driver doesn't have to, were implemented after 28-year-old Allison Warmuth was fatally run over by a duck boat in April 2016. Warmuth's parents pushed lawmakers to make the changes. "We really would like to see duck boat companies take it upon themselves to be as safe as they can be," Warmuth's mother, Martha Warmuth, said on Friday. "There needs to be a lot more oversight into a lot more aspects." Meanwhile, some other operators have scaled back. In Seattle, after five students were killed in a 2015 duck boat collision with a bus, the company removed half its fleet. Duck boat tours in Philadelphia were suspended indefinitely after two crashes there killed three people. The NTSB makes recommendations, but has no regulatory power to enforce them. The fact that their recommendations after the 1999 Arkansas duck boat disaster have gone largely ignored frustrates Hall, the former chairman. "It's clear," he said. "State authorities should ban them for recreational usages."